The discovery of gold in John Sutter's millrace on January 24, 1848, set in motion the people and events that we know as the California Gold Rush. As it spread across the continent, the news of this discovery launched hundreds of ships and hitched up a thousand prairie schooners from great ports and small towns across the nation. Those who joined the procession--in 1849 and throughout the next dozen years--came from every class, from the wealthy to those in straitened circumstances, from every state and territory, including slaves brought by their owners. It was the greatest mass migration in the history of the Republic--some eighty thousand in 1849 alone and probably three hundred thousand by 1854. The most astonishing feature of the Gold Rush was the inclusiveness of the opportunity to strike it rich: anyone with a pick, pan, and shovel could participate--at least in the early years--regardless of wealth, social standing, education, or family name. The mines seemed to contain an inexhaustible vein of gold--$300 million was harvested between 1849 and 1855. In addition, many people made their fortunes by providing goods and services to the mining communities. Men hauled freight to the mines, opened stores and saloons, built gambling houses and bowling alleys for evenings and Sundays; women established boarding houses, washed and ironed, and baked pies. These varied enterprises, enabled by the wealth that flowed from the mines, added a permanent and prominent urban dimension to the Gold Rush and led to the establishment of agricultural enterprise to feed this expanding population. 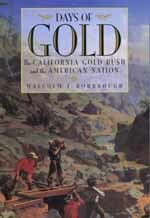 To be sure, the State of California began to assume its modern shape in the dozen years after the discovery of gold, but the consequences of the California Gold Rush spread well beyond the Golden State. Like a stone dropped in a deep pool, the impact of the discovery of gold spread outward in ever-widening circles to touch the lives of families and communities across the nation. Those who proposed to go to California confronted questions about marital obligations and family responsibilities as they weighed the opportunity for wealth against the certainty of prolonged absence. Those who remained behind on the farm or in the shop were also profoundly affected, as the absences of tens of thousands of men over a period of years reshaped thousands of communities all over the nation. Once its impact on families and communities is properly understood, the Gold Rush emerges not only as an incident in California history but also as a shared national experience. Indeed, it was the most significant event in the first half of the nineteenth century: from Thomas Jefferson's purchase of Louisiana in the summer of 1803 to South Carolina's secession from the Union in the winter of 1860, no other event produced so much movement among peoples, called into question so many basic values (marriage, work, wealth and leisure), had such wide-ranging repercussions, or figured so vividly in the memories of its participants. On the morning of January 24, 1848, James W. Marshall discovered gold in California. The news spread across the continent, launching hundreds of ships and hitching a thousand prairie schooners filled with adventurers in search of heretofore unimagined wealth. Those who joined the procession—soon called 49ers—included the wealthy and the poor from every state and territory, including slaves brought by their owners. In numbers, they represented the greatest mass migration in the history of the Republic. Through extensive research in diaries, letters, and other archival sources, Rohrbough uncovers the personal dilemmas and confusion that the Gold Rush brought. His engaging narrative depicts the complexity of human motivation behind the event and reveals the effects of the Gold Rush as it spread outward in ever-widening circles to touch the lives of families and communities everywhere in the United States. For those who joined the 49ers, the decision to go raised questions about marital obligations and family responsibilities. For those men—and women, whose experiences of being left behind have been largely ignored until now—who remained on the farm or in the shop, the absences of tens of thousands of men over a period of years had a profound impact, reshaping a thousand communities across the breadth of the American nation. Malcolm J. Rohrbough is Professor of History at the University of Iowa and author of Aspen: The History of a Silver-Mining Town, 1879-1893 (1986) and The Trans-Appalachian Frontier: People, Societies and Institutions, 1775-1850 (1990).